I see on the news that it’s starting to cool down in some places. Not here. It’s still getting up to 90° most days, internist but the humidity is starting to let up. And so, it’s time for soup. 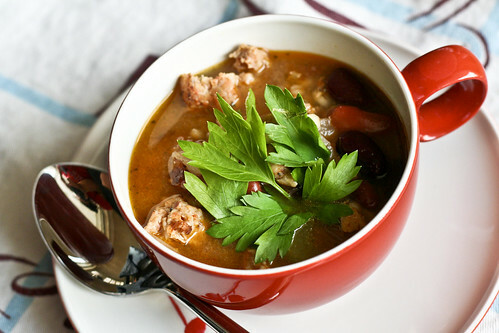 Warm and hearty soups full of beans and grains and vegetables. Yummy soup that fills you up and comforts you on a bad day. I love soup. It’s so good for you, comes together in just a few minutes and you’ve only got one pot to wash when you’re done. A few years ago, when I still lived in a place where it snows in winter, I discovered bean and barley soup. It sounds so simple, I know, but there’s something about red kidney beans and barley that taste amazing together. For this soup, I added in some hot Italian chicken sausage to really make it a meal and some smoked paprika and lime to perk it up. It’s the kind of soup I’ll make on a Monday morning and eat for lunch the rest of the week with some whole grain bread or crackers. It’s thick and flavorful, stick-to-your-ribs goodness. p.s. See if you can spot me in the spoon. Hi guys! If you want to make this soup stretch a bit, just add 1/2 – 1 cup extra barley. Set a large, heavy pot over medium heat. Once it’s hot, add the olive oil, onions and celery. Sautee until the onions and celery begin to soften, about 5 minutes. Add the chicken sausage and brown it, using a wooden spoon to break up any large chunks. When the sausage has browned, add the stock, barley, beans and paprika. Simmer for 20 – 30 minutes, or until it begins to thicken up. Stir in the lime juice and serve. Spinkle with Italian parsley. I love soup myself too Meli. This looks like a soup that I can make at the fire house for the guys while we watch a football game after a job well done at a fire, that’s if we don’t have to use the two greatest inventions to a fireman. 1)tivo-cause it always happeneds: a minute left, tied ball game and we get a call and 2) microwave- cause a good soup like this one always taste better hot. Like they tell us at the fire academy “eating and sleeping are a privilege” and our response “always ready proud to serve”. Mmmm….its not cool here yet, but I can just picture myself with a warm bowl of sausage soup on a cold evening. Looks delicious! well I’m here to report that we did have a fire and we did do a job-well done. the bad news is we didn’t even get a chance to cook, so we had to settle for the burger joint across the street from the station AGAIN!!!. I’m sure I’ll make this soup for the boys one of these days. I’ve made this recipe over five times now – COMPLETELY DELICIOUS! I love it! Some Great soup … I like my soup a bit ‘ Zippy ” usually, so I added a couple pinches of Chili Powder , and and a couple dashes of Hot Sauce … Delicious ! a little layering of heat made it a Real Warm up soup ! … Thanks ! .